Historical fiction, complete with bishounen! The opening of this season finds the main characters in March of 1863, toward the end of the time in Japanese history known as the Tokugawa period, when the city of Edo--present-day Tokyo--is gaining power as a military capital and slowly overtaking Kyoto, which was the ancient cultural center of power, in importance. The political atmosphere of Japan was turbulent at the time; those who supported the shogunate opposed those who favored restoring the Emperor to full power, and a third force was the crushing weight of foreign influence on the previously sealed-off country. The Roshigumi as discussed in this season is a group of between two and three hundred masterless samurai (known by the term ronin). This group most importantly had recruited members of a small, poor dojo called the Shieikan, namely Kondou and his comrades Hijikata, Yamanami, Harada, Nagakura, Inoue, Saitou, and Toudou. A man by the name of Kiyokawa, who formed this group and was mentioned in the first episode, did so with the permission of the shogunate government. Despite this, his true unstated goal was to overthrow the shogunate in favor of the Imperial family, who at this time held status but no real political clout. Under such a guise, with most members unaware of the purpose for which their strength was intended, the Roshigumi traveled from their meeting place in Edo to Kyoto. The opening scene of this prequel series shows that Serizawa ran into our blue-haired protagonist on this initial journey to Kyoto, and the new character wakes up in their new location. Likely to be portrayed in Reimeiroku is the process by which the Roshigumi gives birth to the Shinsengumi. This was the group made up of the main characters and led by Serizawa and Kondou, both of whom refused to cooperate with the founder of the Roshigumi when his true intentions and loyalties were found out; the Shinsengumi supported the shogunate with loyalty. (To visualize the difference between the Roshigumi and the Shinsengumi, think of what they wear: when in action, the Shinsengumi wore garish blue haori to distinguish themselves. At this point in the story, the group is on patrol in the city, breaking up fights, and nobody knows of them as more than troublemaking ronin because they lack a uniform appearance.) Later yet came the division between Serizawa's faction and Kondou's, which became so severe that it led to the assassination of Serizawa and his close supporters. Hakuouki: Shinsengumi Kitan is the first season of the Hakuouki anime. This runs for twelve episodes and covers the time from approximately January of 1864 to the beginning of the year 1868. The protagonist of this season is a girl, and it is because of her that fans seem to either love or despise the franchise. The video game series that goes with the title does, after all, fall into the otome game genre, which appeals to younger women and loses the respect of many a potential male fan. Hakuouki: Hekketsuroku is the second season of Hakuouki, which runs for ten episodes plus a recap "Episode 0" and picks up shortly after the point where the first season left off, from January 1868 to May 1869. Hakuouki: Sekkaroku is the ongoing collection of OVAs that focus on specific characters but are meant as side story companions for the first two seasons' events. 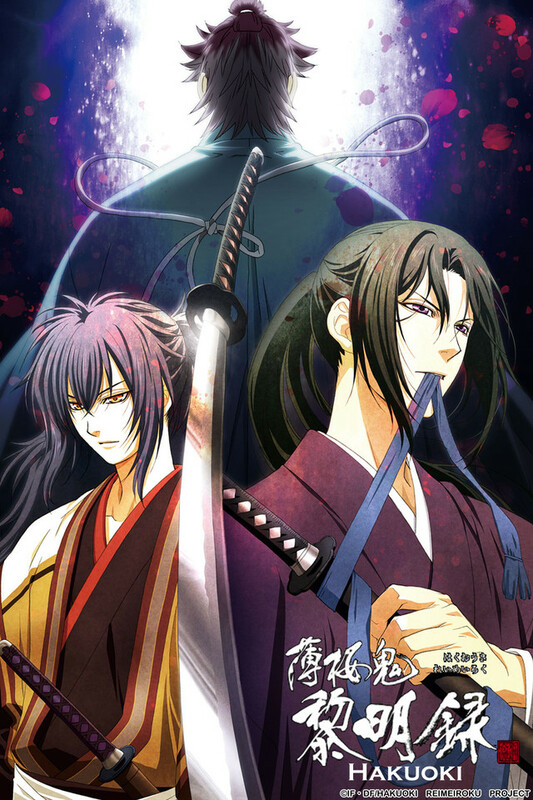 This season, Hakuouki: Reimeiroku, is in fact meant to be watched AFTER the other two, despite being composed of events from a year before the start date of the other media. For your enjoyment, it is recommended that you understand the basic history timeline that affects the plot, as outlined above, as well as see the previous seasons, which are admittedly difficult to find online (though a DVD bundle of the first two seasons can be bought from Amazon for an excellent price). Not only will you be more prepared for and possibly even interested in what is to happen in this plot line, you will be able to actually respect the characters--a foreign concept to most commenters. Those familiar with the Hakuouki franchise seem to be divided: some, from the perspective of the fangirl, love it for the eye candy and the squee factor. On the other hand, those who examine it from a historical standpoint may be deeply disappointed in the liberties it has taken for the sake of popular appeal. Cons about this season so far: The fictional main character, Ibuki Ryunosuke, starts off as a rather flat persona, with a sour disposition and negative outlook on the life he was about to lose. The first episode included so little about the setting and what's about to happen, for those who haven't gotten the history run-down. As mentioned before, the otome aspect still shows in the obvious emphasis on the pretty-boy main characters, and it can be hard to look past their looks to the historical figures upon whom they are based (because yes, they were all real people!). Additionally, the rare moments of humor are of an acquired brand and may not even be recognizable by those not attuned to the characters and the subtleties of Japanese culture and history. Musically, it falls around average: both opening and ending themes are nothing to call home about, and none of the scored tracks have stood out thus far the way some from the first and second seasons did. Pros so far: There is a lot to be said for the premise of this show, as opposed to previous media. This show does not focus on a female love interest for all the males in the reverse harem to swoon over, though female characters do actually exist, and for that it deserves much credit. Since Serizawa makes an appearance right off the bat, it's likely that the politics within the newly formed military groups will be the main focus in the plot. The second episode introduces the small vial of red liquid by which Serizawa's right-hand man, Niimi Nishiki, becomes creepily intrigued. Thus is the fictional element introduced to the story. This has the potential to either make it wonderful or completely ruin it, and it will be interesting to see the way this "rejuvenating water" interplays with the politics of the late Tokugawa period, on the shogunate level and the Roshigumi's level. From both the opening and ending sequences, it looks as though we'll also be getting some backstory from when the boys of the Shieikan were younger. On the visual level, the art is beautifully defined and textured. The animation is obviously above average, the action scenes high-quality, and the color palette varied but fitting, making it seem like a slightly more vivacious atmosphere than what one might have actually found in the shoin-zukuri world of Kyoto and its nineteenth-century samurai. Architecture has been given awe-inspiring attention, and what you see here reflects fine traditional style. The voice acting is phenomenal for the entire cast, from the individuals, including Ryunosuke's newly-cast seiyuu Seki Tomokazu, to the generic nameless soldiers and troublemaking ronin. The show features such stars as Miki Shinichirou (Hijikata) and Yusa Koji (Harada), as well as the not-so-well-known but nonetheless undeniably talented Ohkawa Toru (Kondou), one of the many notable contributors. All things considered, this series is not for everyone, especially as a companion to part of the story that isn't available on Crunchyroll. It can be appreciated and enjoyed with some background information and respect for the Shinsengumi, who are seen as heroes in Japan to this day. Do your homework, good kiddies, and you'll be richly rewarded. Or maybe less than enamored. Who knows? Very good anime! Has you sitting at the edge of your seat! thought chizuru isn't here this is damn good, trust me. I was upset about her not being here and kept watching and it is good if your into historical stuff and fighting which i'm interested in the fighting, and their are alot of cute scenes of the guys we never really saw that much in season 1 or 2 their great! I really like love this! I really love this show... I watched the other 2 seasons.. Though I was looking for the girl.. I was interested on what happened before since this the prequel to the 1st season... I like seeing Okita not sick and Sannan not a zombie/vampire... I liked seeing Saitoh and Okita sparring that was like watching Kenshin and Saitoh fighting in Rurouni Kenshin... Really good fights.. I definately give this 2 thumbs up..
Hakuouki Reimeiroku focuses on the "dawning" of the shinsengumi with fantasy/horror/samurai action! This is one of the best series i've ever gotten into! i really hope the video game gets localized for the psp, i'll almost pay any price for it! This is my favorite season so far in Hakuoki because theres a closer insight into the characters, and all the characters are amazing! I highly recommend the first two seasons as well, its better to watch them before watching this season. Anyone that likes history or samurai-war stories should check this out! Quite a good addition to the Hakuouki series. Instead of Chiruzu being I guess the "human" reasoning side to the samurai, there is Ryonosuke Ibuki. I enjoyed his character. I liked seeing Toshizo before he became such an unfeeling harda$$. Apparently, Sananan-san was always creepy. Admittedly, I was surprised to find my favorite character, Soji, was crazy and enjoyed killing a tad bit too much. It was quite a departure from how I remember his character from the other 2 series. Overall, however, it was good, a little too talky, but good. Enjoyable but seems to just end. I understand that this is a prequel to an ongoing show, in and of itself the anime was good, but the ending made me feel like the show was canceled half way through the season. I believe that if you had seen the original anime you may have gotten more out of this. The characters had good depth and the story line kept you guessing on who were really villains and who were simple doing what needed to be done. If you've never heard of Hakuoki before like myself and didn't watch the previous 2 seasons this show never made any sense what so ever. The animation is good, but really if you don't know whats going on you have no desire to care for the characters and since it's a prequel it's offering some kind of established backstory to established characters who are probably explained in the former seasons. So if you're like me and looking for more shows to get into. Go ahead and pass on this one. The third season of Hakuoki continues as Reimeiroku is the prequel and tells the story of the dawning of the Shinsengumi.